New York Chiropractic College’s Acupuncture and Oriental Medicine Master of Science programs provide comprehensive study in traditional acupuncture and oriental medicine that, combined with instruction in conventional Western medicine and other contemporary healthcare approaches, prepares graduates to practice in a wide range of clinical settings. The programs emphasize an integrative and holistic approach to healthcare that views healthcare within the context of the whole person: body, mind and spirit. 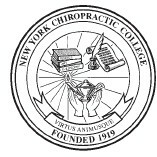 New York Chiropractic College was founded in 1919. Its program in acupuncture and Oriental medicine was granted candidate status by the Accreditation Commission for Acupuncture and Oriental Medicine in 2005. New York Chiropractic College offers a doctoral program in chiropractic, along with a master's degree program that prepares students of professional practice as licensed acupuncturists. Students also study Western sciences and biomedicine to develop skills needed for collaborative medical practice within hospitals and health centers, practice management, and understanding of scientific research. This program is ideal for students interested in a comprehensive education in Oriental medicine that includes Chinese herbal medicine, or plan to apply for licensure in a state requiring training in herbal medicine.